Willy Brandt is a name that is symbolic for the last period of modern politics in which the big gesture determined the fate of a nation for decades. John F. Kennedy’s speach in Berlin which is monumentalized by the quote “Ich bin ein Berliner” or Willy Brandt’s kneefall in front of the Monument of the heros of the Ghetto of Warshau in the year 1970 were such moments in German history. Why do i mention this? The 3’rd episode of the Nomadic Sculpture recently took place on a square in Munich that is named after Willy Brandt from 11’th till 13’th of september. So i thougt it would be nice to recover the story around the name. WTD EpisodeIII Munich-Riem 2014 from What’s the deal? on Vimeo. We all are used to walk over such places without even recognizing their names or the historical background. I think it’s very helpful to read the character of a city by studying those details. However it’s interesting that there is a disturbing contrast between the clear image and meaning of the historical persona of Willy Brandt and the imperfect, vaguely defined and unclear character of the place named after him. This was actually one of the main reasons why it caught our attention. The Square is situated in one of the younger quarters of Munich called Messestadt Riem and is surrounded by a huge hotel complex and a shopping mall very near to the new fair area. The architectural ensemble is one of the boring examples of postmodern German masonry and shows less profile. But the square was supposed to break out of this monotony. Its main feature is a water fountain that nearly covers all the area. It is drafted as a huge circle overlaid with a special pavement and supposed to be flooded equally. The concept belongs to the German artist Karin Sander but the organisation of the construction failed in many ways so that the surface of nearly half of the well is damaged and the flooding system does not work properly. The square now looks quite abandoned and empty in a certain way. The passers by just walk around it on their way to the metro entrance or in the opposite direction. The only function of the place – which has nearly double the size of Munich’s central city square, Marienplatz – is to be passed by as fast as possible. So it perfectly answered the demands of our project. We built the sculpture in the shape of a big question mark, as this sign is kind of a symbol for the whole project. Unfortunately it rained a lot so we could’nt really present on our topic which was “creative consumption”. We planned to offer a showroom for sustainably produced objects and products especially in the fashion field. We invited for example Marissa Brendel who is running the fashion label Afridiva (afridiva.com) which produces fashion items made out of selfmade tissues or recycled material in Madagascar. She sells it in Europe and tries to support the producers back there. Marissa planned a fashion show using the Nomadic Sculpture as a catwalk but unfortunately the weather destroyed all those nice plans. However, we had one day with almost no rain and a lot of kids of the neighbourhood came by who were little impressed by the weather, for they had really waited for days to ride the sculpture. So they came with skateboards, rollers and bikes. We really had to look after them because they were quite wild though. Fortunately we had Tobi Albertross (albertross.de) on the site who held a skateboardworkshop assisted by the skateboardartist Tomcat. They supported the kids with the necessary safety outfit. It was interesting to see that the kids after a while understood the modular principle of the sculpture by themselves and tried to reposition the elements. So it happened that we could create a wonderful interaction which showed how much the kids identified themselves with the sculpture. They really were eager to be part of the creative process. 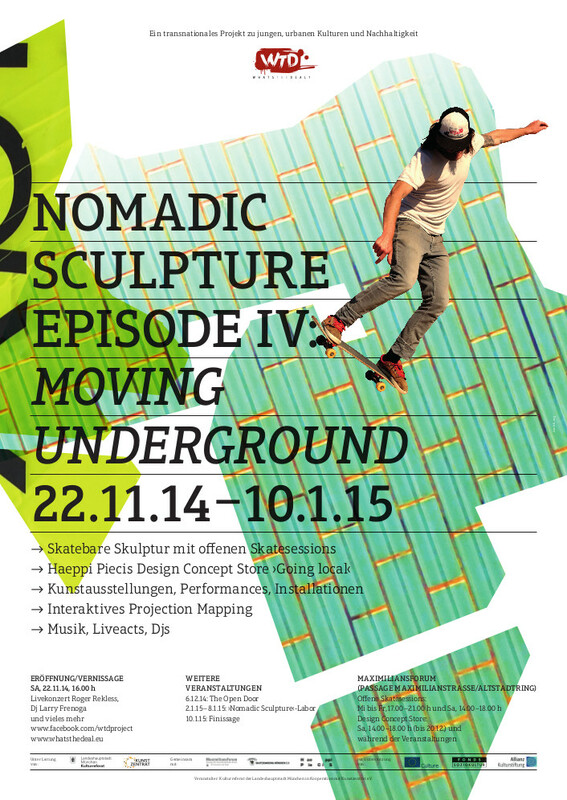 And now we go for Episode IV: The Nomadic Sculpture will visit “Maxforum”. This is a rather huge art space run by the municipality of Munich in the very city center. It is an underpass wich is positioned on Munich’s most expensive shopping area. 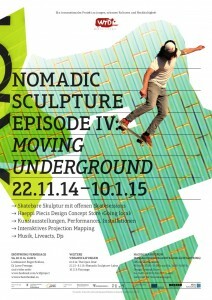 We will move in with the sculpture and have special guests who will work on it with projection mapping. 22’nd of November will be the opening and we will stay there till 10’th of january.